Gas Prices Up- Reduce Your Fuel Costs, NOW! I don’t know about you, but as I have making my daily 40 minute commute to work, I’m seeing these gas prices skyrocketing by the hour it seems! I can’t help but notice the local gas station signs and their prices increasing over .07 cents a day! Whoever’s job it is to bring the pole out and update those numbers is working overtime. Here in LA, we’re above the $4 mark per gallon at some stations. In fact, I filled up my tank on Monday and my receipt came out to $62.70 and I’m not even driving a truck or an SUV. As if it isn’t frustrating enough for individuals, businesses with auto fleets are feeling more pain at the pump and it’s cutting into their bottom line. Here are 10 Ways to Reduce Your Fuel Costs, NOW! Use the right grade of gasoline/ Don’t top off: most cars run fine on regular. Check your vehicle owner’s manual to find out what’s right for your car. (See regular vs. premium.) Don’t “top off” at the pump and make sure your fuel fill cap is on tight and working right. Regular grade fuel cost about 20-cents per gallon less than premium grade. 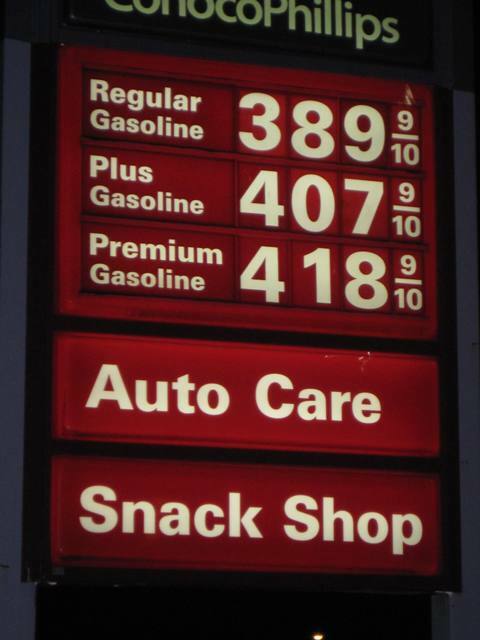 Look for the Best Price / Limit Purchases When gas prices are High: Today’s gasolines provide very similar engine performance (although some brands have different gasoline blends that provide other benefits), so choose stations in your area with the lowest prices. Fuel prices can vary 10% within a few blocks. Avoid filling the tank during high-price periods. Use Carpooling/ Public Transit/ Non-Motorized Options: Ride the bus, carpool, bicycle or walk instead of driving alone. Sharing a ride to work with a friend or two effectively doubles your fuel economy for the trip and may allow you to use the diamond lane. Take Advantage of Telecommuting/ Telecommunications Technology: Many employers offer telecommuting as an option. Use the computer and telephone to replace vehicle trips for business, shopping and services when possible. Don’t Drive Aggressively/ Drive at the Speed Limit: Avoid aggressive driving and aggressive starts. All vehicles lose fuel economy at speeds above 55 mph. Driving 65 instead of 75 mph reduces fuel cost 13%. Driving 55 would save 25%. Reduce Air Conditioner Use/ Close Windows: Using the air conditioner increases fuel cost from 13% up to 21%. If it’s cool enough, use the flow-through ventilation instead of rolling down the windows or using the AC. Eliminate Extra Wind Resistance and Weight: Using a loaded roof rack increases fuel consumption. Carry the load inside your vehicle if you can. Removing unnecessary weight is better still. Minimize Vehicle Idling: Today’s vehicles are designed to warm up fast. Avoid idling when you can; idling is 0 miles per gallon. Maintain Vehicle Efficiency: Regular maintenance as prescribed by the vehicle owner’s manual will help your vehicle achieve its best fuel economy. Some overlooked maintenance items, such as a dirty air filter and under-inflated tires, can increase your fuel cost up to 13%. When replacing your tires, replace them with the same make and model as the tires that were on your vehicle when it was new. It’s been estimated that if all Californians properly inflated and aligned their tires, we’d save 300 million gallons of gasoline a year! Drive or Purchase a Fuel-Efficient Vehicle: Drive your most fuel-efficient vehicle whenever possible. When purchasing, consider the most fuel-efficient vehicle and save up to 50%. Consider a hybrid-electric, a diesel vehicle, or even a motorcycle. The next best option is to purchase the most fuel-efficient vehicle within the class of vehicles you are considering. Please also be aware that many companies will try to sell you mileage improving devices. Some claim that they will save you 10 to 50%. Buyers Beware! The U.S. EPA and Federal Trade Commission have both said that there are no devices that will boost your mileage any appreciable amount. See web page for Energy Myths on Gasoline-Saving Products. Useful article, thanks for taking the time to compose it. I like the direction you are taking your blog. I’ll be bookmarking your site so I can follow along down the road. Hope to see more posts soon. Thank you very much. I appreciate the good words!